The Yakovlev Yak-3 (Russian language: Як-3) was a World War II Soviet fighter aircraft. Robust and easy to maintain, was much liked by pilots and ground crew alike. 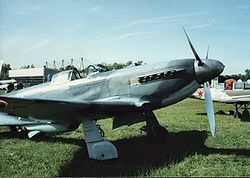 It was one of the smallest and lightest major combat fighters fielded by any combatant during the war, and its high power-to-weight ratio gave it excellent performance. It proved a formidable dogfighter. Marcel Albert, the official top-scoring World War II French ace that flew the Yak in USSR with the Normandie-Ni�men Group, regarded it a superior aircraft to the P-51D Mustang and to the Supermarine Spitfire. After the war ended, it flew with the Czech and Polish Air Forces. The origins of the Yak-3 went back to 1941 when the I-30 prototype was offered along with the I-26 as an alternative design to the Yak-1. The I-30, powered by a Klimov M-105P engine, was of all-metal construction, using a wing with dihedral on the outer panels. Like the early Yak-1, it had a 20 mm ShVAK cannon firing through the propeller spinner and twin 7.62 mm ShKAS machine guns in the nose, but was also fitted with a ShVAK cannon in each wing. The first of two prototypes was fitted with a slatted wing to improve handling and short-field performance while the second prototype had a wooden wing without slats, in order to simplify production. The second prototype crashed during flight tests and was written off. Although there were plans to put the Yak-3 into production, the scarcity of aviation aluminum and the pressure of the Nazi invasion led to work on the first Yak-3 being abandoned in late fall 1941. In 1943, Yakovlev designed the Yak-1M which was a smaller and lighter version of the Yak-1. A second Yak-1M prototype was constructed later that year, differing from the first aircraft in plywood instead of fabric covering of the rear fuselage, mastless radio antenna, reflector gunsight and improved armor and engine cooling. The chief test pilot for the project Piotr Mikhailovich Stefanovskiy was so impressed with the new aircraft that he recommended that it should completely replace the Yak-1 and Yak-7 with only the Yak-9 retained in production for further work with the Klimov VK-107 engine. The new fighter, designated the Yak-3 entered service in 1944, later than the Yak-9 in spite of the lower designation number. Production accelerated rapidly, so that by mid-1946, 4,848 had been built. The designation Yak-3 was also used for other Yakovlev projects - a proposed but never built, heavy twin-engine fighter and the Yakovlev Yak-7A. 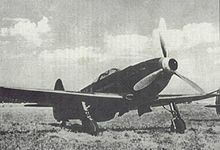 The first 197 Yak-3 were armed with a single 20 mm ShVAK cannon and one 12.7 mm UBS machine gun, with subsequent aircraft receiving a second UBS for a weight of fire of 2.72 kg (6.0 lb) per second using high-explosive ammunition. All armament was installed close to the axis of the aircraft (cannon firing through the rotor shaft and synchronised machine guns in the fuselage above the engine), adding to the accuracy and leaving wings unloaded. Lighter and smaller than Yak-9 but powered by the same engine, the Yak-3 was a forgiving, easy-to-handle aircraft loved by both rookie and veteran pilots and ground crew as well. It was a robust, easy to maintain and a highly successful dogfighter. It was used mostly as a tactical fighter, flying low over battlefields and engaging in dogfights below 13,000 ft. The new aircraft began to reach front line units during summer 1944. Yak-3 service tests were conducted by 91st IAP of the 2nd Air Army, commanded by Lt Colonel Kovalyov, in June-July 1944. The regiment had the task to gain air superiority. During 431 missions, 20 Luftwaffe fighters and three Ju 87s were shot down while Soviet losses amounted to two Yak-3s shot down. A large dogfight developed on 16 June 1944 when 18 Yak-3s clashed with 24 German aircraft. Soviet Yak-3 fighters shot down 15 German aircraft for the loss of one Yak destroyed and one damaged. The following day, Luftwaffe activity over that section of the front had virtually ceased. On 17 July 1944, eight Yaks attacked a formation of 60 German aircraft, including escorting fighters. In the ensuing dogfight, the Luftwaffe lost three Junkers Ju 87s and four Bf 109Gs, for no losses to the Yaks. Consequently, the Luftwaffe issued an order to "avoid combat with Yak fighters without an oil cooler under the nose and with an inclined aerial mast below 5000 m". In fact, most of the Yak-3s had no mast, the aerial wire running from canopy to fin.Luftwaffe fighters in combat with the Yak-3 tried to exploit the surprise tactic, attacking from above. Unresolved wartime problems with the Yak-3 included plywood surfaces coming unstuck when the aircraft pulled out of a high-speed dive. Other drawbacks of the aircraft were short range, and poor engine reliability. The pneumatic system for actuating landing gear, flaps and brakes, typical for all Yakovlev fighters of the time, was problematic. Though less reliable than hydraulic or electrical alternatives, the pneumatic system was preferred due to significant weight savings. Picture - Free French Normandie-Niemen Yak-3. Klimov VK-107A engine with 1,230 kW (1,650 hp) and 2 x— 20 mm Berezin B-20 cannons with 120 rpg. After several mixed-construction prototypes, 48 all-metal production aircraft were built in 1945-1946. In spite of excellent performance (720 km/h/447 mph at 5,750 m/18,865 ft), VK-107 was prone to overheating and it was decided to leave the engine for the better-suited Yak-9. Yak-3 (VK-107A) modified with VK-108 engine with 1,380 kW (1,850 hp), and armed a single 23 mm Nudelman-Suranov NS-23 cannon with 60 rounds of ammunition. The aircraft reached 745 km/h (463 mph) at 6,290 m (20,636 ft) in testing but suffered from significant engine overheating. Another Yak-3 with 2 x— 20 mm Berezin B-20 cannons was also fitted with the engine with similar results. produced from April 1945 until mid-1946, armed with 3 x— 20 mm Berezin B-20 cannons with 120 rounds for the middle cannon and 130 rpg for the side weapons. The three-cannon armament with full ammunition load was actually 11 kg (24 lb) lighter than that of a standard Yak-3, and the one-second burst mass of 3.52 kg (7.74 lb) was greater than that of most contemporary fighters. Starting in August 1945, all Yak-3 were produced in the Yak-3P configuration with a total of 596 built. high-altitude interceptor with Klimov VK-105PD engine and a single 23 mm Nudelman-Suranov NS-23 cannon with 60 rounds of ammunition, reached 13,300 m (43,625 ft) in testing but did not enter production due to unreliability of the engine. experimental aircraft with an auxiliary Glushko RD-1 liquid-fuel rocket engine with 2.9 kN (650 lbf) of thrust in the modified tail, armed with a single 23 mm Nudelman-Suranov NS-23 cannon with 60 rounds of ammunition. On 11 May 1945, the aircraft reached 782 km/h (485 mph) at 7,800 m (25,585 ft). During the 16 August test flight, the aircraft crashed for unknown reasons, killing the test pilot V.L. Rastorguev. Like all mixed powerplant aircraft of the time, the project was abandoned in favor of turbojet engines. tank destroyer version armed with 1 x— 37 mm Nudelman N-37 cannon with 25 rounds and 2 x— 20 mm Berezin B-20S cannons with 100 rpg. Cockpit was moved 0.4 m (1 ft 4 in) back to compensate for the heavier nose. Engine modifications required to accept the weapons resulted in serious overheating problems which were never fixed and the aircraft did not advance beyond the prototype stage. powered by a VK-107A engine, and fitted with an exhaust turbocharger. Yak-3 fitted with Shvetsov ASh-82FN radial engine with 1,380 kW (1,850 hp) in an attempt to increase performance while avoiding the overheating problems of VK-107 and VK-108. Wingspan increased by 20 cm (8 in), wings moved 22 cm (9 in) forward, cockpit raised by 8 cm (3 in). Armament of 2 x— 20 mm Berezin B-20 cannons with 120 rpg. The prototype reached 682 km/h (424 mph) at 6,000 m (19,685 ft) and while successful did not enter production because it was completed after the war. two-seat conversion trainer based on Yak-3U powered by Shvetsov ASh-21 radial piston engine. 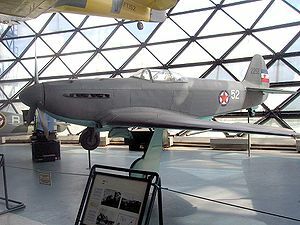 The aircraft became the prototype for the Yak-11. In addition, since 1991, a number of replica Yak-3s have been newly manufactured by Yakovlev for the warbird market using the original plans and dies. These are powered by Allison V-1710 engines and have the designation Yak-3M. Several of these are airworthy today, mostly in the United States, but also in Germany and Australia. 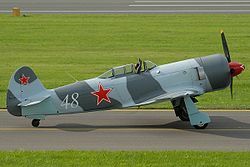 Others have been converted as reproductions instead, to "Yak-3U" status from Yak-11 trainers for private owners, with these aircraft also being popular worldwide. Gordon, Yefim. Soviet Airpower in World War II. Hinckley UK: Midland / Ian Allen Publishing, 2008. ISBN 978-1-85780304-4. Gunston, Bill. Aircraft of World War Two. London: Octopus Books Limited, 1980. ISBN 0-7064-1287-7. Matricardi, Paolo. Aerei Militari: caccia e ricognitori. (in Italian) Milano: Mondadori Electa S.p.A., 2006. NO ISBN. Morgan, Hugh. Gli assi Sovietici della Seconda guerra mondiale. Edizioni del Prado/Osprey Aviation, 1999. ISBN 84-8372-203-8. Шавров В.Б. История конструкций самолетов в СССР 1938-1950 гг. (3 изд.). Kniga: Машиностроение, 1994 (Shavrov, V.B. Istoriia konstruktskii samoletov v SSSR, 1938-1950 gg.,3rd ed. (History of Aircraft Design in USSR: 1938-1950). Kniga, Russia: Mashinostroenie, 1994. ISBN 5-217-00477-0.